The Faces of Fuzz: A Brief History of the Fuzz Face. I thought I would post a brief history of the good old Fuzz Face here. 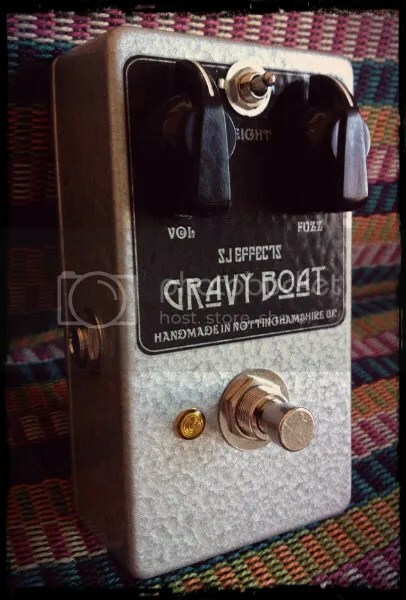 My new pedal, the Gravyboat Fuzz, is based on the Colorsound One Knob Fuzz, with some tweaks and mods to make it fit more into a wider range of applications. The Gravy Boat, via the Colorsound One Knob Fuzz, can be traced back to the Arbiter Fuzz Face; the one that started it all! Please also note that I have not covered any of the many modern variants of the Fuzz Face around, notable examples including the D*A*M Meathead, Meathead Deluxe and SuperBee, the Dunlop Fuzz Face re-issues (including the artist models), the Analogman Sunface etc. etc. Also please note that these are my own personal thoughts on the tones these pedals produce. Tone is subjective, and you may have a very different impression of these circuits sounds and vibe! The first Fuzz Face was the one that started it all; The Arbiter Fuzz Face. The tones a Marshall head combined with a good germanium fuzz face produce can verge on divine! It arrived in late 1966, in its iconic big, red and round enclosure. The original units used Germanium transistors, which produce a more ‘organic’ and warm distortion (IMO of course) compared to silicon, as a result of a softer clipping characteristic, and respond to rolling back guitar volume controls very well. Notice I say distortion and not fuzz. In my opinion, germanium Fuzz Faces can work just as well as an overdrive/distortion as a fuzz if the guitar volume control is carefully used. A well tuned and biased Germanium fuzz can go all the way from clean, to crunch to all out Fuzz with a twist of your guitars volume control. The original transitors used in these germanium Fuzz Faces were NKT 275’s, which are pretty much un-obtainium nowadays. If you find some be prepared to pay top £ for the pleasure. However, many other Germanium transistors can be used to good effect if carefull attention is paid to their gain (Hfe) and leakage characteristics. The downside to the lovely warm fuzz that the old Germanium NKT275’s produced was the inconsistency; Germanium Transistors vary wildly in gain, leakage, and to top it off, are also temperature sensitive. Your old Germanium Fuzz Face will most likely sound very different depending on temperature! Certain Fuzz Face aficionados will say that a Fuzz Face must have NKT275’s to be the real deal. I would not agree with this. In my opinion transistor selection (hfe, leakage etc. ), biasing, and component selection is far more important to the overall quality of tone. If you are in the UK/EU, and fancy building a germanium Fuzz Face, then Doctor Tweek (www.doctortweek.co.uk) usually has a nice range of Germanium transistors for sale at a very reasonable price. 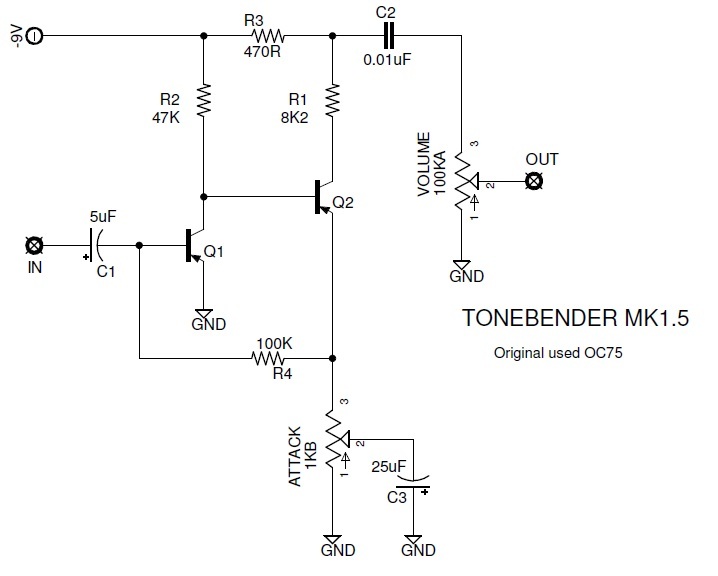 Note: There is speculation that the Tonebender Mk1.5 came before the Fuzz Face, and that Arbiter used the circuit for the original round and red fuzzer; more info later! Due to problems with temperature stability, and consistency issues, Arbiter began making Fuzz Faces using Silicon transistors in the late 60’s. Silicon Fuzz Faces exhibit a more aggressive fuzz tone; harder and more intense than the Germanium variants. Also, in general, they do not react as well to ‘cleaning up’ by rolling of guitar volume controls etc. However, many people, myself included, prefer the more intense and general ‘fuzzy’ nature of silicon Fuzz Faces. The silicon transistors used by Arbiter included BC108C, BC183L, BC109, BC109C, and BC209C. Most of these transistors are still readily available. Many other silicon transistors sound great as well. Even the ubiquitous 2N3904 can sound great in a silicon Fuzz Face circuit. Oh, and it is believed that the master of all guitar players; Jimi Hendrix, used a silicon Fuzz Face at his Woodstock performance! The modern Dunlop Jimi Hendrix Fuzz Face (the blue one) also uses Silicon transistors (BC108’s). If you fancy building your own fuzz face, our good friend Doctor Tweek also sells a nice range of silicon transistors (including BC108’s and 9’s). 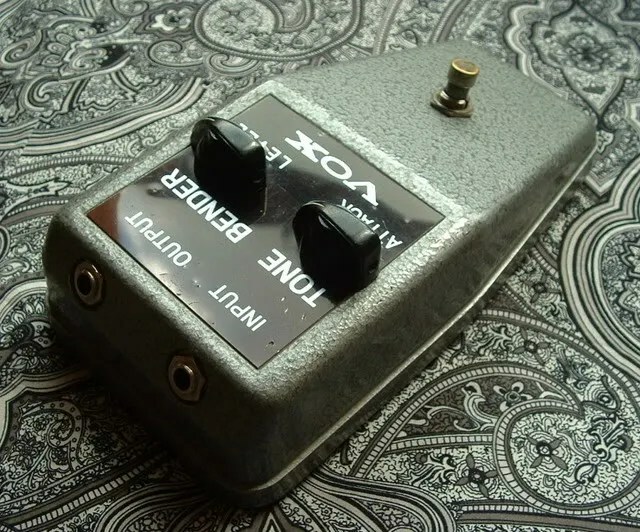 The Vox ToneBender arrived at a similar time to the Arbiter Fuzz Face (production spanned from 1966-68), and was most likely based on the Tonebender MK1.5. 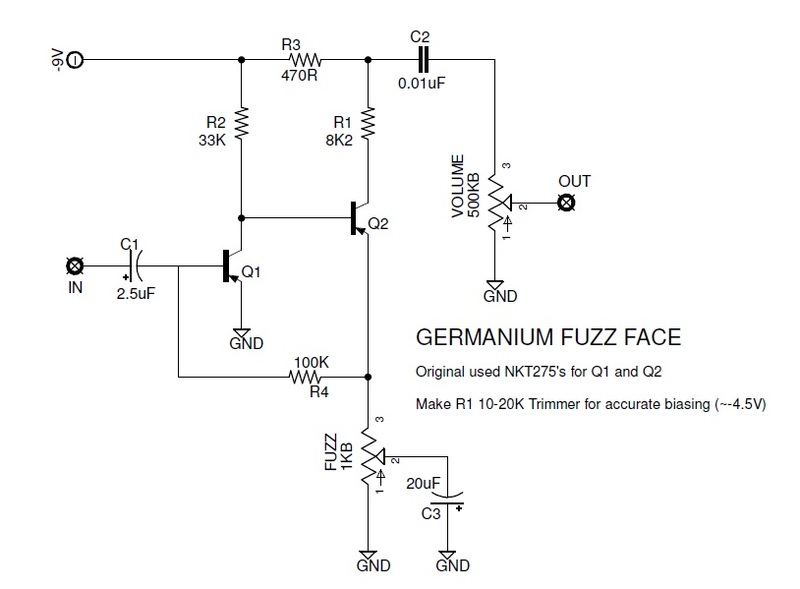 Notice the addition of a couple of resistors to the standard Fuzz Face schematic. These are also sometimes referred to as Italian Tonebenders, due to them being manufactured in… you guessed it… bella Italia! The difference in tonality is clear when using this circuit. Component differences (particularly smaller input and output coupling capacitors) result in a far more treble laden and less ‘woolly’ fuzz than the original fuzz face. Perfect for playing through a dark amp (eg. VOX AC30), but perhaps overwhelmingly ‘ice-picky’ through bright amps (Fender Twins etc.). There is also in general less overall gain and sustain available with these units in comparison to the standard Fuzz Face. 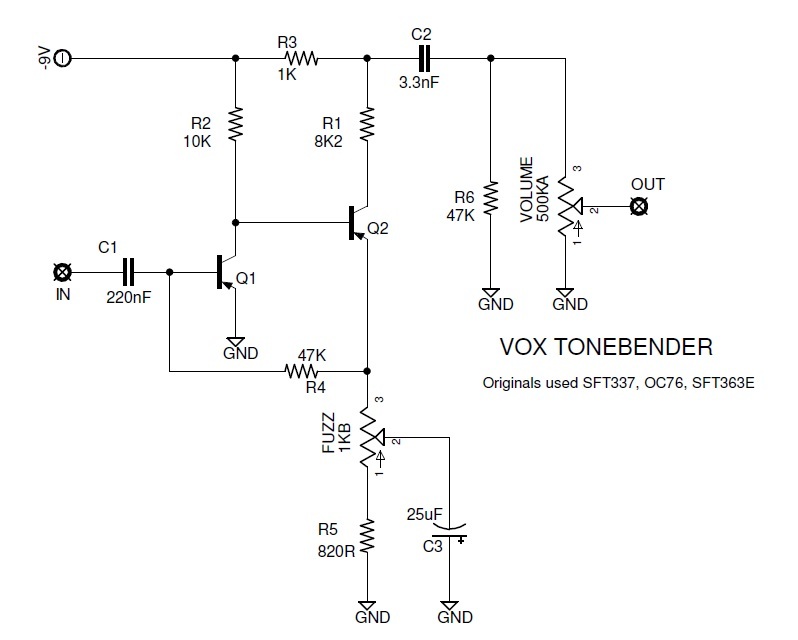 Original transistors used in the Vox Tonebender were usually an SFT337 for Q1 and an OC76 for Q2. These will be hard to come by, but not as ridiculously priced as the ‘Holy Grail’ NKT275’s. It is also worth noting that silicon versions of this circuit were also produced. Sola Sound Tonebender Mk 1.5. The ToneBender Mk1.5 is a Fuzz Face variant of particular interest. This may be the original unit that spawned them all. The reason for this is that it actually pre-dates the original Arbiter Fuzz Face (production began 1965). Therefore it is more than likely that Arbiter based the Fuzz Face on this circuit! This fuzz utilised the classic glass cased Mullard OC75 germanium transistor for Q1 and Q2. A classic transistor in the Fuzz World, also used in the Tonebender MkII (another fabulous fuzz pedal). These transistors are quite rare and hard to find. If you find some, hold on to them! They were built like a tank, and also, surprisingly for the time, featured true bypass switching and shielded in/out wiring. The sound of these units is more similar to the classic Fuzz Face, in comparison to the Vox Tonebender with its treble heavy tone. They sure do look cool though don’t they! Note. A top notch, no expense spared, Mk1.5 re-issue is available from the original retailer and manufacturer; Macaris Music. Be prepared to have to pay, and wait, for the pleasure of owning one though! Now we come to my own personal favourite, and the basis for my own Gravy Boat Fuzz, the Colorsound ‘One Knob Fuzz’. 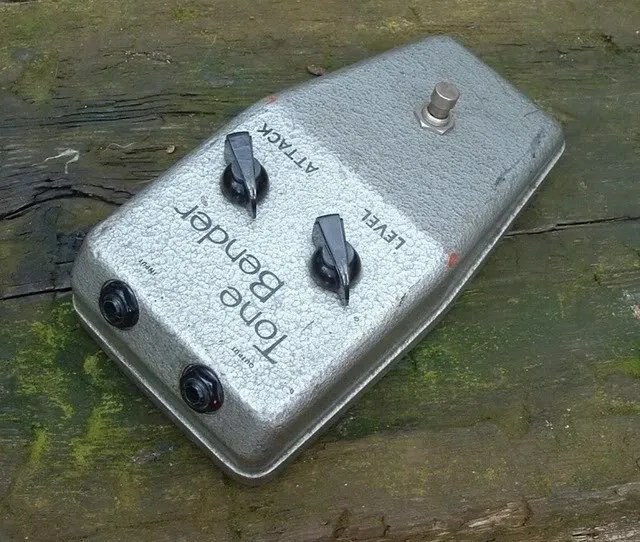 A silicon Fuzz Face variant employing BC109 and BC108 transistors, this fuzz produces a full, thick, intense fuzz tone; far more fuzz than your standard silicon Fuzz Face. They also happen to sound incredible when using a bass. There was only one control on the One Knob Fuzz; volume. The relevant fuzz control resistor is set to 1K for all out fuzz attack. If you are after a ‘transparent’ Fuzz Face that cleans up well on the volume control then this is definitely not for you, but if you are after a massive fuzz tone… look no further. A variety of interesting fuzzy tones can, however, be attained by adjusting your guitars volume and tone controls. 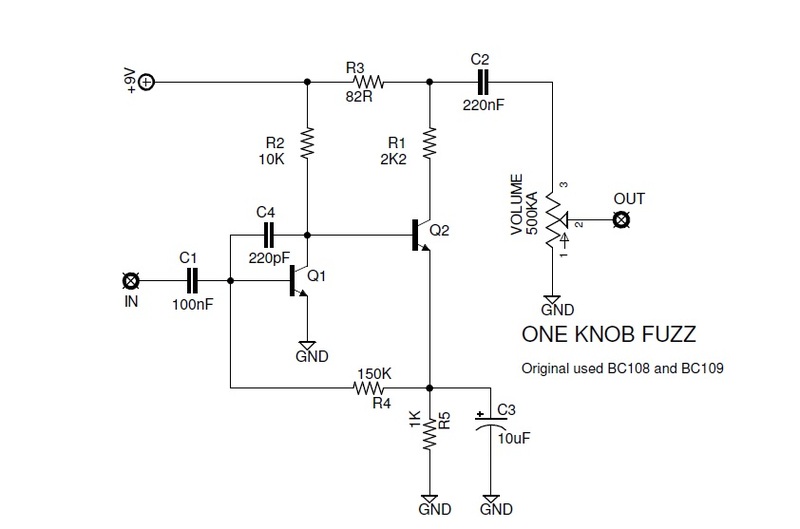 You may notice the extra capacitor between the base and collector of Q1 when looking at the schematic below. This capacitor is in the circuit to replicate the ‘Miller effect’; the high frequency roll-off that occurs with the Fuzz Face’s original germanium transistors. They also prevent oscillation and other nasty side effects that can occur when using silicon transistors in the fuzz face circuit. Many modern silicon based Fuzz Face variants feature these capacitors to tame the high end and avoid oscillation. I can’t rightly finish a roundup of Fuzz Face variants without mentioning my own now can I! My Gravy Boat Fuzz is based upon the Colorsound One Knob Fuzz, with tweaks to the design to get it to my exact liking. The pedal also features an internal bias control (bias is one of the most important factors in Fuzz tones) so it can be dialled in exactly at the sweet spot. The Fuzz Face is one of the most popular (if not the most popular) fuzz pedals around, and not without good reason. Depending on circuit and component selection, it can conjure a range of tones ranging from spitty and splatty mis-biased velcro buzz, to smooth and warm touch sensitive overdrive. There are many, many, Fuzz Face clones and variants available to purchase, ranging from tens of pounds all the way into the thousands. However, if you are a DIY’er, or fancy getting your feet wet, the Fuzz Face is a perfect pedal to build up and experiment with. I recommend getting the breadboard out, grabbing a beer, and building up the different variants, experimenting with bias, in and out coupling capacitors etc. to come up with your own perfect Fuzz Face. 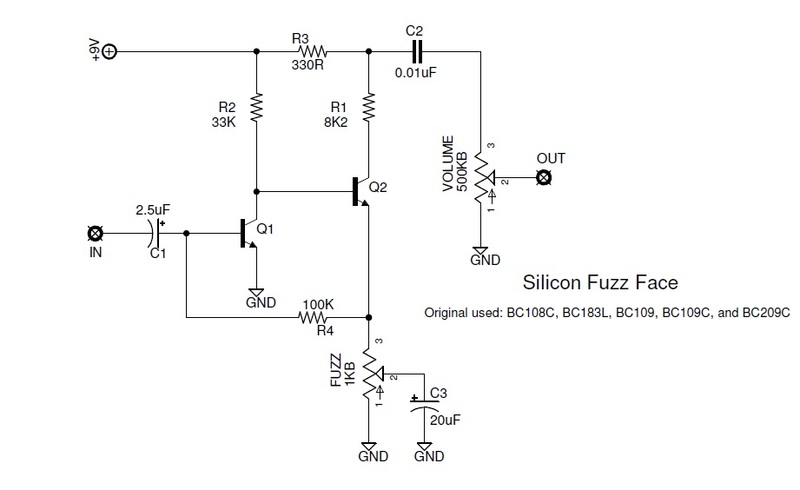 The standard Fuzz Face hfe values are usually recommended at 80-90Hfe for Q1, and 110-130Hfe for Q2. However, experimentation is key. For example, the recent Joe Bonamassa Fuzz Face features Germanium transistors with a much lower hfe, but still produces a lovely smooth fuzz tone. The beauty of the circuit is its versatility for such a simple design, and perhaps this is the reason for its enduring popularity after over 40 years on the market. That completes my small roundup of Fuzz Face variants. I hope you found the information helpfull, and if you get a chance to try any of these classics, you will not be dissapointed with the fuzzy goodness they provide! This entry was posted in Uncategorized and tagged custom effects, custom fuzz pedal, custom fx, custom guitar effects, custom guitar pedals, fuzz, fuzz face, fuzz pedal, guitar effects, one knob fuzz by sjeffects. Bookmark the permalink.